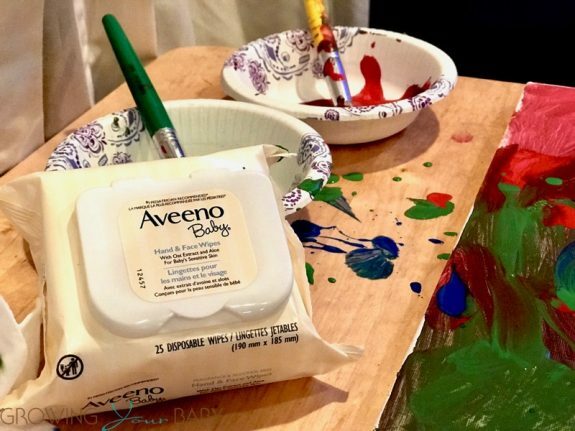 Aveeno Baby Hand & Face Wipes Are Made For Sensitive Skin & Every Messy Moment Your Child Will Create! Home » Aveeno Baby Hand & Face Wipes Are Made For Sensitive Skin & Every Messy Moment Your Child Will Create! Raise your hand if you’re a mom, you don’t have babies and you still have a pack of wipes in your purse. I sometimes think my boys pride themselves on getting as dirty as possible every chance they get. Whether it’s mealtime or playtime, they still come out looking like they’ve never met a cloth. My problem is I can’t use just anything on my oldest son’s hands, face or body. He is allergic to a long list of ingredients, which is why we love Aveeno. Their Aveeno Baby Wash & Shampoo, and lotions have been a staple in our house for years because they are hypoallergenic and paraben free. For this reason, we were thankful when they shared that their new Aveeno baby wipes were created with the same principles. Free of fragrances, soaps, phthalates, parabens, sulfates, alcohols, dye, formaldehyde, chlorine and gluten, they nourish and restore balance to baby’s skin with oat extract and aloe. These wipes are gentle enough to use every day, leaving baby’s skin feeling clean, soft, and moisturized. Some experts believe that babies should only be bathed a couple times a week, so these wipes can also serve as a quick way to wipe them down at the end of the day. Conveniently packaged with 25 wipes and a resealable lid, the Aveeno Baby Hand & Face Wipes are easy to throw into your bag or backpack or keep in the console of your vehicle to ensure your kid will be presentable – even when they don’t want to be! Kids aside, I’m personally obsessed with them for myself and have used them to give my face a quick wash if I’m traveling. Their Aveeno Baby Wash & Shampoo is the only cleanser I’ll use because it doesn’t dry my skin out or irritate it. It’s truly one of my go-tos. Aveeno Baby products are available at most national food, drug, and mass merchandisers. Please visit Aveeno.ca/baby for more information. Incredible Gentle C-Section En-Caul Birth Captured On Camera!